So, I’m a day late on this. But I’m slow on the uptake. Anyway, as others have already pointed out, Toronto City Councillor Karen Stintz of Ward 16 (Eglinton-Lawrence) wants to get rid of cyclists on sidewalks in the city. You may know Ms. Stintz as the TTC chair at the moment, since council is in the midst of mercilessly slashing transit service providing enhanced customer service and smaller government, in line with the new government’s priorities. You may also remember Ms. Stintz from her earlier days as a shrill councillor (note to self: $3875 for French lessons = gravy train; $4500 for public speaking lessons = Rob Ford in tights). Seriously... why fight women involved in roller derby? You can't fight them armed only with good diction. Real women use rollerskates to commute. No word yet on whether city council will warn dog walkers of the imminent danger they face. 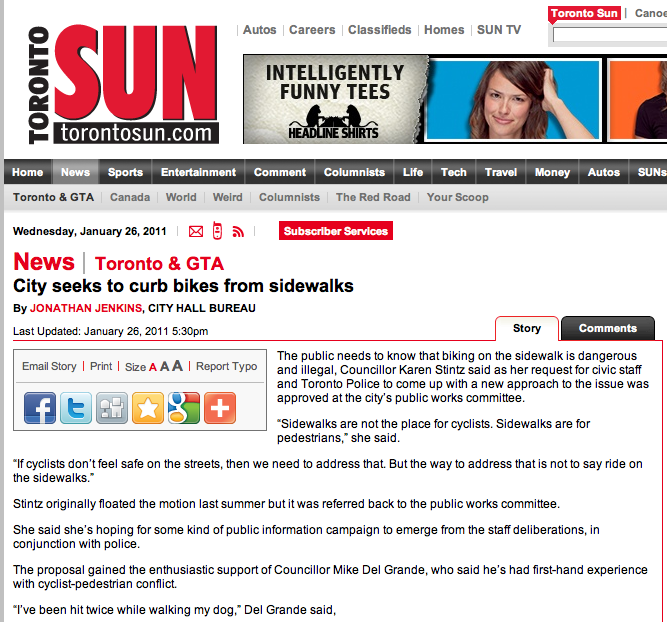 It’s a little unclear what, exactly, Stintz wants to do about cyclists on the sidewalk. According to the Toronto Sun, the approach is “come up with a new approach.” According to CBC, she wants to enforce the bylaw banning cyclists from sidewalks (no word, however, on whether or not they plan to enforce the bylaw via some sort of stern warning keeping cars out of bike lanes, but judging on the parking enforcement van there, I wouldn’t get my hopes up). 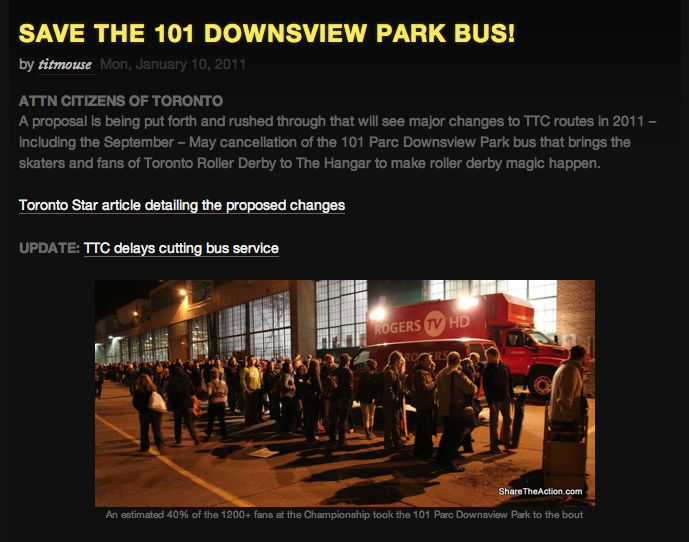 One side of the story the Toronto cycling community (cyclommunity?) hasn’t addressed, though, is that these sidewalk menaces are preying on nuns! 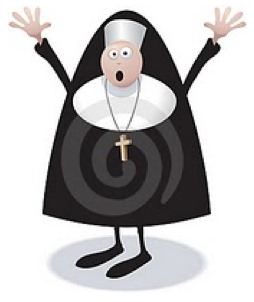 Sister Mary Sibbald, a Toronto nun, likes the idea of cracking down. Surreptitiously, for those who may not possess the vocabulary imparted to those in the convent, implies that the cyclists are keeping this on the hush-hush, for dear that their nun-hunting ways would not be approved by general society. Can you blame them though? Nuns are clearly the most beloved segment of our society. Sure, they may have some questionable history, but how can cyclists sleep at night with all these terrified nuns, too frightened to once again roam their natural habitat of the streets of Toronto? This is something we just can’t tolerate. My personal vote is for invisible razor wire to be strategically placed on all sidewalks, which can only be seen by special goggles worn by pedestrians, leading to the beheading of those rogue sidewalk bikers and their child-sized mountain bikes. In all seriousness, if you ride your bike on the sidewalk at a speed much faster than a walk when there are people around, you are a bit of a jerk. But, realistically, Scarborough isn’t exactly known for its bike-friendly streets. As is always said, enforcement should only be strict if you are planning on putting in the appropriate infrastructure for those cyclists you are kicking off the sidewalk to ride safely on the road. I’m pretty comfortable on city roads, and I’ve been hit by cars three times; twice from cars pulling into bike lanes without looking, and one door prize. By all means, cyclists should be on the roads and off the sidewalks as much as is humanly possible, but the responsibility to evoke that change belongs to more than just cyclists and law enforcement. 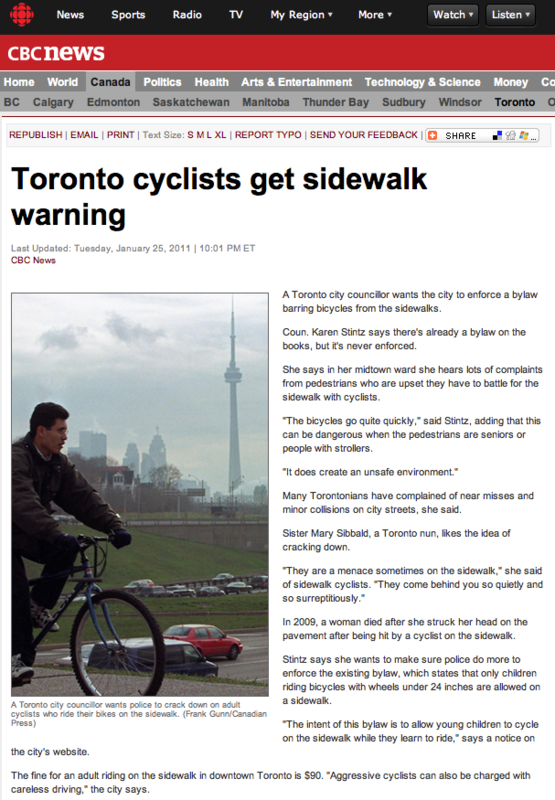 This entry was posted in BikeTO and tagged Big Words, bikeTO, Karen Stintz, Nuns, Sidewalks, Toronto City Council. Bookmark the permalink. Hmmm, maybe if all cyclists wore cute and cuddly animal costumes then people would be more understanding. It would be all… “aw, I just got hit by a panda, how cute”. Also for cyclist riding on the road, they should consider those spikey things sticking out of their wheels… the ones that pop the tires on the cars.